Scientists have found that two-dimensional (2D) nanostructures with asymmetric design enable a new quantum mechanism, triggering the emission of tunable light at terahertz frequencies ? with unprecedented efficiency. The researchers, from the University of Southampton and Imperial College London, found that quantum wells, 2D nanostructures formed of several layers of semi-conductor alloys placed on top of each other like a sandwich, can enhance light emission in a technological challenging spectral range. It is hoped that the findings will have an impact on photonic and optoelectronic devices across a broad range of applications, including harmless medical imaging and security scanning. Electrons are trapped in the structure and this confinement can be exploited to enhance their capacity to interact with light at given frequencies much lower than the laser frequency at which they are excited: the system emits light by interacting with “vacuum fluctuations” that permeate space, according to quantum theory. In the paper, which is published in Physical Review B, the researchers predict that by shining light on a 2D asymmetric nanostructure with a laser that is tuned at resonance with the electronic transitions that can occur in the nanostructure, in addition to the scattered laser light, this 2D device would emit light at other frequencies, which can be tuned simply by changing the laser power. Nathan, who co-authored the paper with Dr Simone De Liberato, from the QLM group, and Professor Chris Phillips from Imperial College London, adds: “Due to the large oscillating dipole and high density of electrons that characterise these “artificial atoms” formed of asymmetric 2D structures, the control of light-matter coupling can be greatly enhanced, triggering spontaneous light emission, similar to what occurs in LEDs lamps. 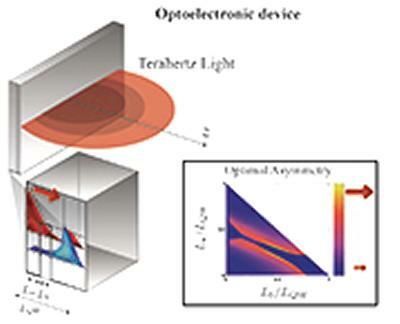 The high efficiency shown by the simulations suggests that this theoretical result could be exploited in the near future for a broad range of optoelectronic applications—from harmless medical imaging and security scanners, to short-range, ultra-fast wireless communication.